Old-world quality, care and detail go into every Italian Sausage we make – it’ll make you say “Mamma Mia!” – It’s that good. Our taste specialists have put their discerning palate to the test for years to perfectly season the Italian Sausage to ensure that all that is good and traditional goes into every bite. Authentic flavor is blended in our own kitchens, not concocted in a lab. Feeling good about what you serve your friends and family is important. They can rest assured that you are only willing to serve them a sausage that uses prime cuts of pork, that were masterfully blended with simple, traditional herbs and spices. Feel confident in telling them that it is nutritious, without preservatives, artificial ingredients or fillers. 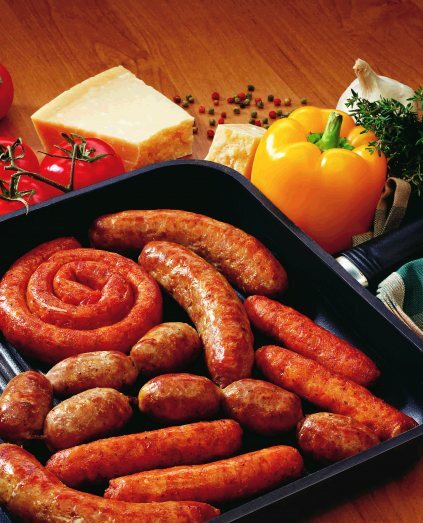 The Italian sausage is a product you can feel confident feeding to the entire family. Ever sausage is made to meet our highest standards in our state of the art, federally inspected plant. Each morsel of pork is hand cut by our individual skilled craftspersons, not on a production line where quality and attention to detail can be compromised. We leave nothing to chance. When it comes to serving your loved ones the very best, remember we are probably serving the Italian Sausage to our loved ones tonight! Try the Italian Sausage on its own for a gourmet meal or feel like a top chef in your kitchen tonight by adding it to your favorite recipe. Need a meal idea? Please follow to our Recipes link.